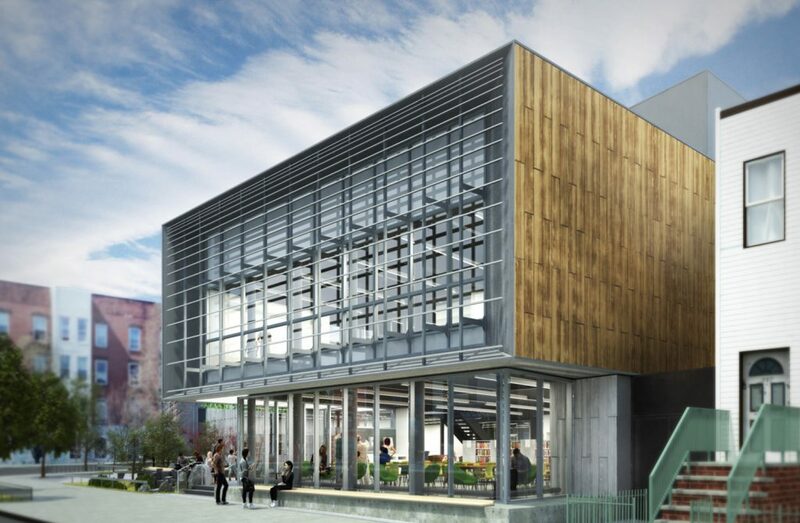 The Brooklyn Public Library (BPL) has officially broken ground on the two-story replacement for their Greenpoint branch, at 107 Norman Avenue. 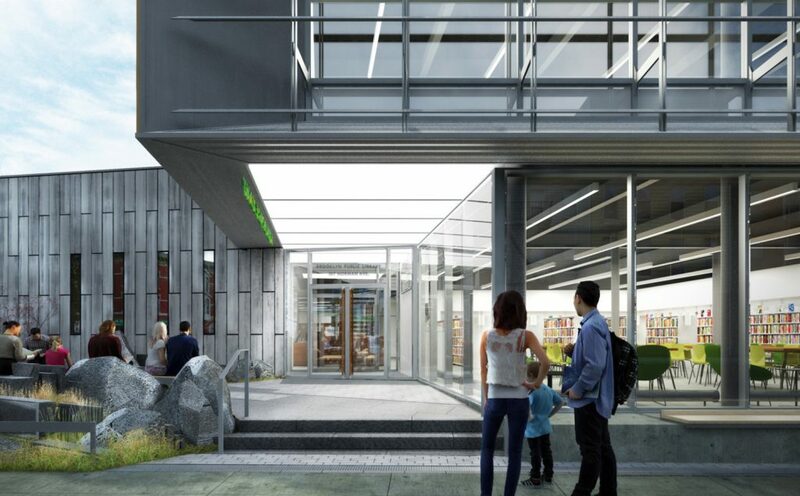 The innovative new space touts environmental sensibility integrated directly into the educational center, and is poised to receive LEED-Gold Certification. 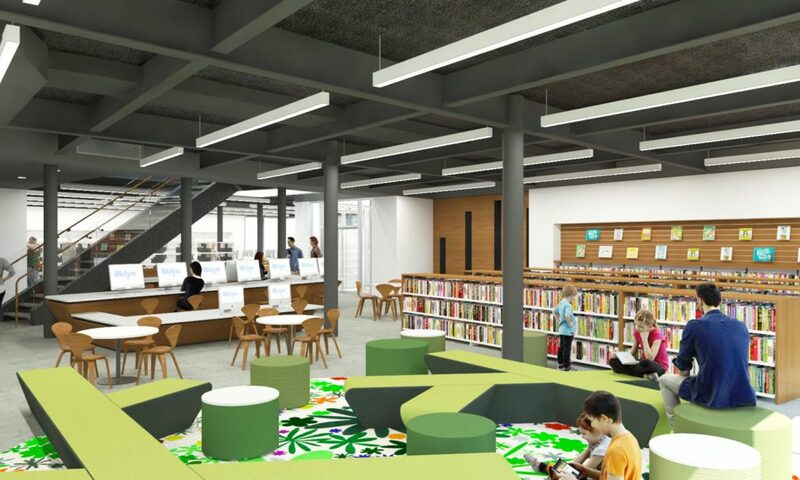 Funding came from a $5 million grant from the Greenpoint Community Environmental Fund (GCEF), and a $10 million grant from the Library. GCEF is a $19.5 million grant program created by the State of New York, with monies obtained through a settlement with ExxonMobil over its Greenpoint oil spill in 1978. The new site will promote environmental awareness, education, and advocacy, in light of one of the largest oil spills recorded in American history. The spill happened just a mile away, with an estimated volume of seventeen to thirty million gallons. 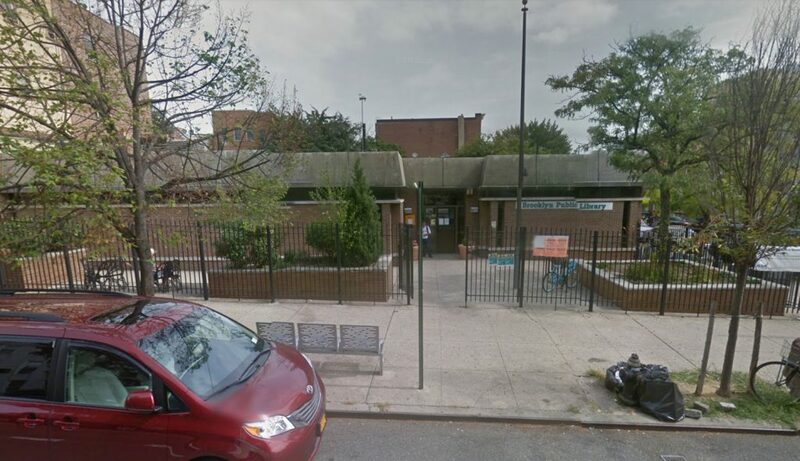 The Greenpoint Library is one of the busiest branches within the system. 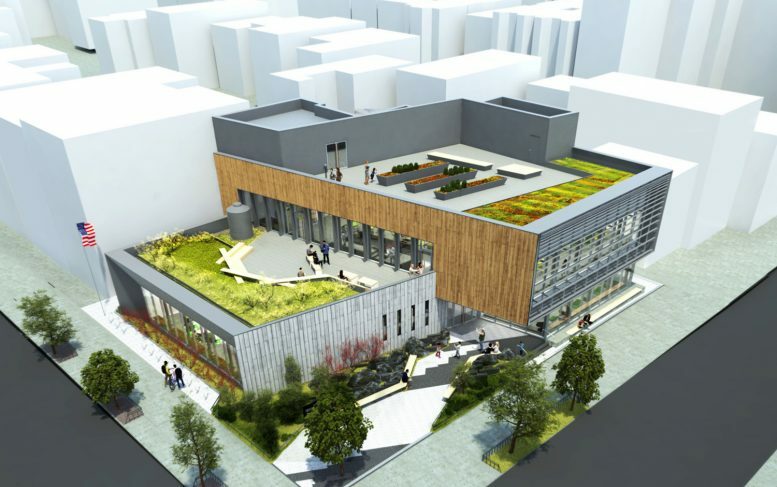 The previous building was undersized and dated, and the redevelopment will double its square footage. The 28-foot tall structure will yield a total 14,800 square feet. 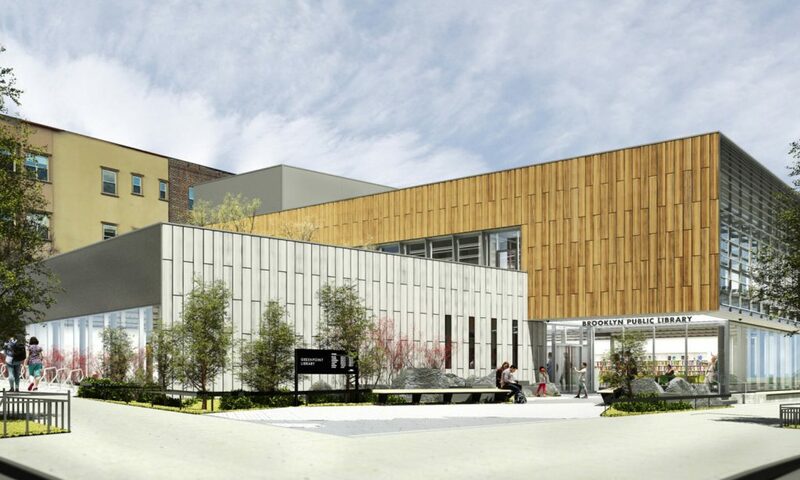 Renderings show an attractive design that’s a marked improvement from the less-welcoming building previously on site. The concept is not just to attract readers, but to facilitate community meetings and programs, with a specialized emphasis on environmental education. Marble Fairbanks is responsible for the structure’s design, and SCAPE/Landscape Architecture is responsible for landscaping. The BPL is an independent library system for the 2.5 million residents of Brooklyn. It is the fifth largest library system in the United States, with 60 neighborhood libraries located throughout the borough. In other news, an unprecedented move was made last Thursday by the BPL, along with the New York Public Library and Queens Public Library, who cover the entirety of New York City. They united to offer unconditional amnesty for late fees accrued by anyone under 17. They will also clear fines for those in high school, and over 17 years old. The Libraries were able to provide this act of forgiveness thanks to $2.25 million dollars donated by the JPB Foundation. The standard fine system resumed on Friday. 3 Comments on "Groundbreaking, Reveal for New Brooklyn Public Library at 107 Norman Avenue, Greenpoint"
My backlashes have heavy on brain’s development. Nice to have a bigger building, with modern facilities. However it would be even better if there were more BOOKS available at this branch when it reopens. After all, after all the bells and whistles – it is a library. I DON’T UNDERSTAND HOW OR WHY YIMBY ALLOWS “WELCOME HOME (DAVID)” TO POST TO THEIR WEBSITE UNLESS HE IS SOMEHOW CONNECTED TO SOMEONE AT YIMBY, EVEN STILL HE SHOULD BE BLOCKED HIS COMMENTS ARE SOOOOO ANNOYING AND CRYPTIC – I DID SEE SOMEONE PREVIOUSLY TRY TO CALL HIM OUT AS AN IMPOSTER ALLUDING TO HIM BEING SOMEONE ELSE IN CONST/REAL ESTATE INDUSTRY….DOES ANYONE ELSE FEEL THE SAME?